There are many fun activities and classes to get involved in at EC Manchester this month. Why not come and join us! Every Thursday and Friday there is a language workshop for you to improve areas of your English. The area changes every week so you can choose which you would prefer the most from pronunciation, writing, preparing your CV and grammar. Also, IELTS clinic every week will help you to prepare for the exam. There are many fun trips this month around lovely areas of the UK. If you prefer the quiet countryside and walking among the hills, the Peak District is perfect. If you fancy spending some money, head over to Chester and the Outlet on February 10th to find designer brands at cheaper prices. Or if it’s historical buildings and more of a buzzing city you enjoy, why not join the trip to Edinburgh or York to discover some of the wonderful cathedrals, castles and old shopping streets. 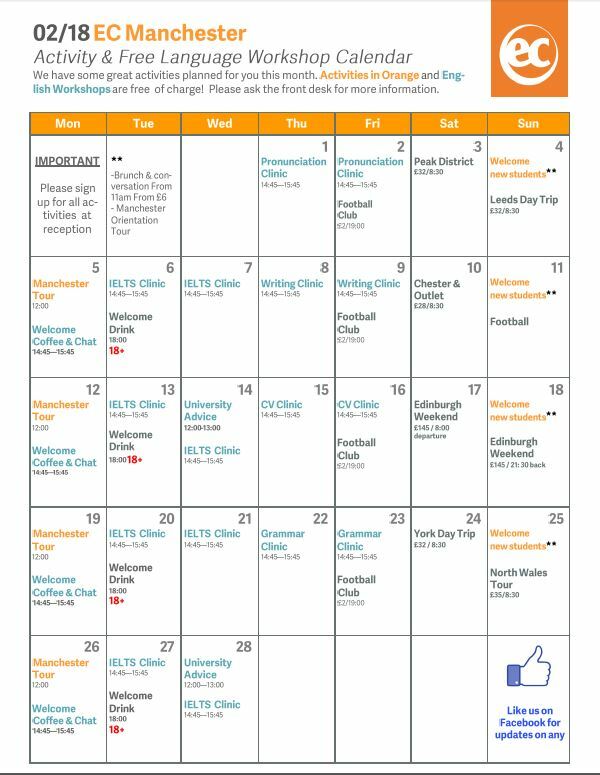 As always, we have coffee and chat on Mondays and the welcome drink on Tuesdays to get to know the new students and make friends or if you prefer something a little more active, the football club on Fridays is always a popular option. If you are thinking about studying at a UK University and are interested in preparing for the IELTS, why not register for our EC Manchester IELTS special focus class to get yourself ready. Have a fun February at EC Manchester!